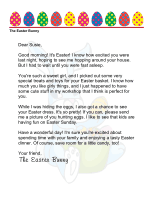 This printable letter, to be mailed from the Easter Bunny, asks children to think about the true meaning of Easter and the resurrection of Jesus. 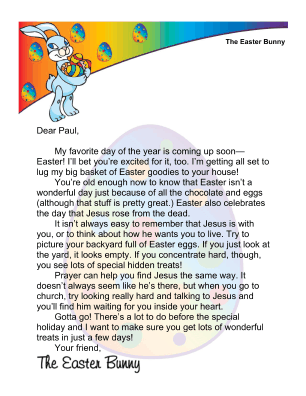 The rabbit encourages boys and girls to look for Christ in their hearts the same way they look for candy during the Easter egg hunts. My favorite day of the year is coming up soon-Easter! I'll bet you're excited for it, too. I'm getting all set to lug my big basket of Easter goodies to your house! 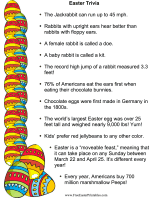 You're old enough now to know that Easter isn't a wonderful day just because of all the chocolate and eggs (although that stuff is pretty great.) Easter also celebrates the day that Jesus rose from the dead. It isn't always easy to remember that Jesus is with you, or to think about how he wants you to live. Try to picture your backyard full of Easter eggs. If you just look at the yard, it looks empty. If you concentrate hard, though, you see lots of special hidden treats! Prayer can help you find Jesus the same way. It doesn't always seem like he's there, but when you go to church, try looking really hard and talking to Jesus and you'll find him waiting for you inside your heart. Gotta go! There's a lot to do before the special holiday and I want to make sure you get lots of wonderful treats in just a few days!